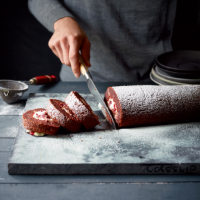 This easy roulade doesn't taste of beetroot, instead the vegetable adds richness to the chocolate, and makes the sponge lovely and moist. 1 Preheat the oven to 180˚C, gas mark 4. Grease and line a 32 x 22cm swiss roll tin with baking parchment. Cook the beetroot in simmering water for 15–20 minutes or until tender, then drain and cool. Remove the skin and trim, then blitz the flesh in a blender until smooth. 2 Melt the butter with the chocolate and coffee in a medium pan over a low heat. Leave to cool for 5 minutes. In a large bowl, whisk the egg yolks with the caster sugar until thick and pale, then whisk in the cooled chocolate mixture. Fold in the beetroot and flour. 3 Whisk the egg whites until they hold soft peaks then fold into the chocolate base. Pour into the prepared tin and spread level. Bake for 25–30 minutes until just firm. Lift the cake out with its paper onto a wire rack, cover with a clean damp tea towel and leave to cool completely. 4 To make the filling, soak the cranberries in the brandy or orange juice for 30 minutes. Whisk the cream until just thick then stir in the cranberries and any juices. Turn the chocolate sponge out onto a clean sheet of baking parchment and trim the edges neatly. Spread with the cream, leaving a border around the edge, then use the paper to carefully roll the sponge up. Transfer to a serving dish and dust with icing sugar. Chill until ready to serve. Make the chocolate sponge up to 3 days ahead and keep, rolled up but unfilled, in an airtight container. To freeze: make the chocolate sponge and fill, roll up, cover and freeze for up to 1 month. Defrost thoroughly before dusting with icing sugar to serve. This recipe was first published in Thu Nov 06 16:44:00 GMT 2014.